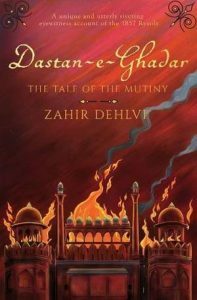 The memoirs of Zahir Dehlvi released with the title of Dastane-e-ghadar in the English language is a great effort of Rana Safvi for preserving the culture of 19th century Zafar’s Delhi and event surrounded by the siege of Delhi in 1857 AD. I was among one of the few readers who booked the book in advance from Amazon before it releases. I will be going to read the memoirs of 1857 AD Delhi in English from an eyewitness for the first time in my life. This might be a reason for the underlying curiosity other than the scholarly affiliation with the translator, Rana Safvi who carries an excellent reputation in historical writings. The event of 1857 AD that is first war of Independence for us and mutiny for British Empire hold an important significance in shaping the future of Indian Sub-Continent. This is a well-researched topic for historians and scholars. Although, a lacuna exists in the role of Bahadur Shah Zafar and circumstances that forced him to join as the leader of the rebels. The plight of noble citizens of Delhi is an unforgettable traumatic fact for Indians. Very few oriental accounts like Sarguzasht-e-Delhi by Jivan Lal and Begmat ke aanso by Khwaja Hasan Nizami has covered the events and aftermath of 1857 AD. As mentioned in translators introduction by Rana Safvi that Zahir was the poet, not a historian, that’s why main accounts were left without dates and he skipped few major events related to mutiny. The main strength of memoir is the role of Zahir Dehlvi as an eyewitness for most of the incidents that were centered in Delhi. Recently education research shifted focus from quantitative to qualitative approach as the latter carries an importance in understanding phenomenon or process. Even my area of expertise i.e., Medical Education (one of the evidence-based field in education) gave more emphasis on qualitative research in comparison with quantitative approach. In the terms of educational research, the Zahir accounts can be considered as a qualitative data that reached to the readers in the form of written narrations. The memoirs gave an excellent description of the cultural zenith of Delhi that was achieved after British control in 1803 AD. Although a detailed account has been presented in Dalrymple’s, the last Mughal. Again Zahir memoirs gave us a flavor of tale reading from an eyewitness, a unique distinction to this book. For example, the description Sair-gul-faroshan is narrated in a manner that reader can find himself standing in the procession. The narrations and events of mutiny gave an in-depth description of the devastation caused by the arrival of the mutineer (freedom fighters) in the cultural capital of early nineteenth century India. The reciprocation of East India company appeared to be worst for the noble citizen than the treatment of mutineers. The events of mutiny and helplessness of Bahadur Shah Zafar as described by the Zahir will create an empathy among the readers. One can feel the pain and trauma experienced by Bahadur Shah Zafar and his noble citizens during the fall of Delhi at the hands of British forces. The events of September 1857 during the siege of Delhi reminds me of 1258 AD siege of Baghdad (once a cultural capital of Abbasids under Caliph Al Mustasim). I can draw the similarities between two events, both cities reached the cultural epitome, marked the end of the strongest dynasties, their leaders supervised the cultural renaissance and catastrophic end of the civilizations by the hands of conquerors. The story of the migration of Zahir (a generous poet from a Mughal court and genealogical offspring of Caliph Ali) is a sample version for understanding the plight of the most cultured and educated citizens of Hindustan. From the court of Rampur to the generosities of Nawab Ibrahim Khan at Tonk, the narrations of princely states helps us to understand the vibrant culture of North Indian princely states. An affiliation of Jaipur and Alwar state towards culture, Sufism and Urdu poetry reflected moral and religious syncretism developed down the centuries in Hindustan. In some narrations, the hyperbole is present while describing both positive and negative attributes, for example, the description of the princely states of Jaipur and Hyderabad states, it is quite evident. This might be happened due to the old age and sufferings he received with the loss of his family members especially his son and son in law. The valuable addition of the timeline of Ghadar, historical notes, maps and Qila-e-Molla plan will facilitate the readers to correlate the memoirs of Zahir Dehlvi with dates, personalities, and architectural landmarks. The first time, I came to know the origin of the names of Paiwala’n Bazar and Kucha Chela’n from Rana Safvi notes. I would like to thanks and congratulate Rana Safvi for translating a worthy account.